Here is our long awaited Bowflex LateralX review, everything you need to know about this brand new cardio machine from the company that brought you the Max Trainer, TreadClimber, home gyms and other popular residential equipment. This is the first new release from the company since about a year ago when they introduced their new line of traditional treadmills and ellipticals. That release wasn’t quite as exciting as this one, as the new LateralX trainers have the potential to be big sellers for the company. Some of the questions that our readers have had are: How does the LateralX compare to the Max Trainer and traditional ellipticals? How does the side to side motion work? Does it really give you a more complete workout and can you burn a lot of calories? Check out the special limited time sale here for the best savings of the year! In a nutshell, the new Bowflex LateralX is an elliptical trainer with three directions of movement. On top of the forward and back, up and down motion of a traditional machine, you get a third direction. As you might have guessed, this new motion is side to side. The concept is not entirely new, although you won’t find it on too many machines. Octane Fitness, a high end brand also from Bowflex’s parent company, Nautilus, Inc., also offers a LateralX trainer. However this is a club quality machine that cost over $6,000. Bowflex’s versions are less than half of that, making them much more accessible. What’s the advantage of the lateral movement? Well, according to the company’s research it engages more muscle groups in the legs, which makes a lot of sense because you are incorporating a new plane of movement. There’s more emphasis on the glutes, quads and hamstring muscles. Also, the side to side motion also mimics some of the movements that you do in everyday life, from basic chores to sports training to just going through your day. And it makes sense. Think about what you do every day. You don’t just walk up and down or forward and back. Many things require you to move from side to side as well. So the new LateralX trainers incorporate that additional lateral movement. Another cool thing that you really can’t do on a Max Trainer or an elliptical is lean back and/or squat while you use the machine, a very cool feature that gives you yet another way to work out. By using the stationary handles, you can actually recline and hit those leg muscles in a different way than you can while you’re standing up. Bowflex claims you can burn 39% more calories with the LateralX trainer in 16 minutes than you can with a self guided program on a traditional elliptical trainer. Calorie burn is a big focus for Bowflex in general, and you’ll notice that all of their machines feature this benefit. 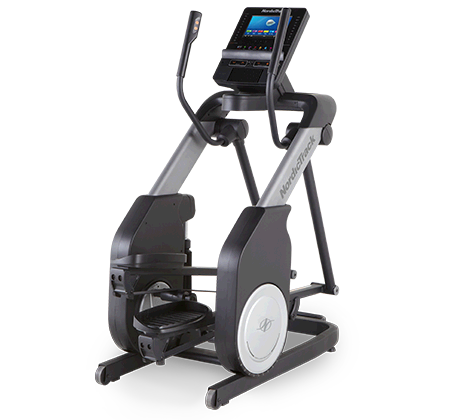 Just like with their traditional elliptical trainers, the company offers 2 different LateralX Trainers…the base LX3 and the up-level LX5. The two machines are very similar, but they do have some differences that are definitely worth mentioning. The base LX3 model comes with a fixed side to side motion, 8 built in resistance levels, 8 workout programs, a 7.5″ LCD backlit display showing all of your relevant workout metrics, heart rate grips, a max user weight capacity of 300 lbs. and a 1 year warranty. The step-up LX5 adds a few features to the mix. You get an adjustable side to side motion, 10 resistance levels, 10 built in programs, multi position grips on the moving handlebars, wireless heart rate monitoring and a stronger 3 year warranty. Both Bowflex LateralX trainers have a space friendly profile, a media rack, Bluetooth 4.0 to track your workouts via the Bowflex app, Bowflex radio and 12 weeks worth of workout videos (30 in all) featuring professional trainers. As long as you have a tablet, you can take advantage of these awesome in-class sessions that hep you get the most out of your workouts. They also have a third option currently, and that is the Bowflex LateralX LX5 Performance Pack. This is for those who don’t have the aforementioned tablet, and includes a 9.6″ Samsung Galaxy Tab E Tablet as well as a workout mat and free shipping. It’s about $300 on top of the price of the LX5 by itself, and may be a good option for you. OK so those are the models and the features, but you’re probably wondering…what about the workout? We were getting to that. 🙂 Here’s what we found during out LateralX reviews. For starters, we liked the compact profile. Although not as space friendly as the Max Trainers and TreadClimbers, at a little over 63″ long the LateralX machines are much smaller than traditional elliptical trainers. As such they are a good option for the home gym. The look and feel is similar to the other machines, with the signature Bowflex red accents on both machines. The 7.5″ display is large enough and easy to read, and gives you all of the information you need. Both LateralX machines feature a nice array of built in workouts, including the X-Mode 16 minute interval program that really amps up the training. It’s a series of total body and lower body only movements that help burn a lot of calories. It’s definitely very challenging, but you can work your way up to it. There are also other programs such as total body, calorie goal, fat burn, dual direction and manual. The up-level LX5 gives you a few more workout choices including lateral, thigh toner and quad power, as well as 4 user profiles instead of two. We have our own iPad that we use, so we didn’t test out the optional Samsung Galaxy tablet that comes with the LX5 performance package. But syncing results to the Bowflex app was relatively easy once you figure things out…you can keep track of all of your results and sync them with your favorite fitness apps. It works similarly as on other Bowflex machines. So the workouts are good, there’s plenty of variety and you can challenge yourself with manual mode too by changing the resistance and your stance. The side to side motion takes a little time to get used to. We use the Octane LateralX machines at the gym, so we’re used to that added lateral element. But if you haven’t used one of these machines it’ll take a bit before you are accustomed to it. Once you are though, you’ll appreciate the freer range of motion. The free videos are great as well. There’s are 30 of them in all, so you’ll definitely find ones that appeal to you. There’s some LateralX specific workouts as well as some cross training exercises for off machine use. Overall we found the variety satisfying, and the featured trainers were quite motivating. For one, the Bowflex LateralX trainers, although much more affordable than Octane’s versions, are still on the expensive side. The base LX3 model is around $1,999 on sale, and the up-level LX5 is about $2,699. Although they do give you a great, unique workout, they may be a bit out of range for you. This isn’t really a negative though, as if you can afford it you will be very happy with your purchase. It would be nice if the LateralX machines came with touch screens like some of the higher end elliptical trainers do these days. That way you could watch the videos right on the machine itself, rather than need to use a tablet. Again, not a real negative, just something that would add to the convenience. If we had to pick one actual negative, that would be the warranty, which is an issue with the Max Trainer, TreadClimber and other Bowflex machines as well. The base LX3 has a paltry 1 year warranty…the LX5 is a bit better at 3 years, but if you compare that to lifetime frame and 3-4 year parts on most other $2,000+ elliptical trainers and treadmills, you can see how the LateralX falls short in this area. We would suggest adding a 3 or 5 year protection plan if you do decide to buy the LX3 or LX5, just to give yourself some additional coverage should any problems arise. Hopefully Bowflex will start adding stronger warranties to their machines in the future. Still, users have been more than happy with the Bowflex machines and you really don’t hear as many complaints as you do about some of the other popular brands. So hopefully you won’t have to worry about anything breaking down. What’s the bottom line on the LateralX Trainers? If you’re looking for a unique, low impact cardio machine that’s a little different than your everyday elliptical trainer, the new Bowflex LateralX is certainly worth a look. You can burn a ton of calories and target muscles that you just can’t on other trainers. The side to side motion is a great addition, and it helps foster more balance and control in your everyday life. There are plenty of built in workouts and the free 12 week training program to help you reach your fitness goals. Between the two, we would lean towards the LX5 if it’s within your budget, as it gives you more workouts, resistance levels and user profiles, as well as wireless heart rate monitoring and the ability to adjust the lateral motion. But the LX3 is also a great choice, giving you the same challenging workout and ultimately the same results as the more advanced LX5. Regardless of which Bowflex LateralX machine you choose, you’ll get a challenging, results-generating cardio workout that you just can’t get anywhere else. Compare both models and see special sale pricing here to decide which one is right for you!